A Crysis 2 multiplayer demo is on the way but you'll only get to play it if you're an Xbox Live Gold subscriber. Crysis 2 doesn't show up until March but to give gamers a taste of what's to come, EA and Crytek are tossing out a multiplayer demo on January 25. Players will duke it out across the "Skyline" map in one of two game modes: "Team Instant Action," which pits two teams against each other in a no-holds-barred deathmatch, and "Crash Site," a control-point battle over alien drop pods. "Crysis 2 offers a fresh, new take on multiplayer," said Crytek CEO Cevat Yerli, despite the fact that the two game modes in the demo are neither fresh nor new. "The Nanosuit gives gamers a sense of power they have yet to experience in any other shooter and having New York City as a backdrop will present a different type of playground with even more possibilities." Sadly, if you're not an Xbox Live Gold subscriber the only way you'll be able to find out if it's any good is to ask a friend who is, because it's coming exclusively to Microsoft's online service. Whether it will eventually make its way to the PC and PlayStation 3 isn't known at this point, but I wouldn't hold my breath. For better or worse, demos these days seem more about cranking up the publicity machine than giving gamers a chance to sample the goods and decide whether or not they're actually interested. 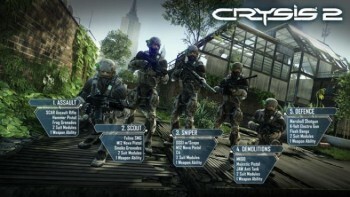 Crysis 2 comes out on March 22 for the Xbox 360, PC and PlayStation 3.